The 2018 season was not going the way driver James Hinchcliffe had hoped. Until, that is, late in Sunday’s IndyCar Series race at Iowa Speedway when he tracked down and passed a seemingly unbeatable Josef Newgarden and then drove off to victory. 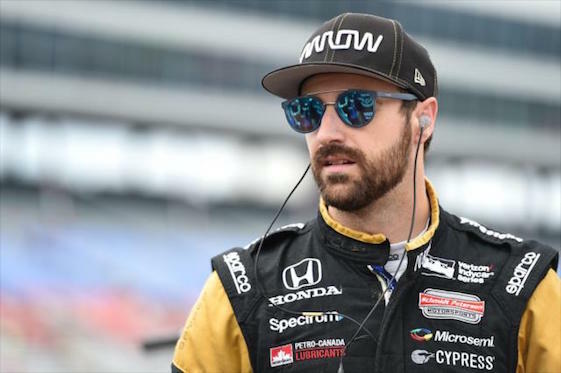 The win was the first of the season for Hinchcliffe – who failed to qualify for the Indianapolis 500 earlier this year – and his Honda-powered Schmidt Peterson Motorsports team. The victory came under yellow as a small wreck laid down debris on the track with seven laps to go. Track workers were unable to get the debris cleaned up in time to re-form and re-start the field. Finishing second was Spencer Pigot of Ed Carpenter Racing in the No. 21 Chevrolet. Third was Takuma Sato in a Rahal Letterman Lanigan Racing Honda. The runner-up finish by Pigot was a career-best. Rounding out the top five were Newgarden of Team Penske and Canadian Robert Wickens, who also pitted for tires during the final yellow. The first half of the race was all Newgarden. After passing pole-sitting teammate Will Power early, Newgarden began pulling away to huge leads. Twelve laps in, he began lapping the slower cars in the field. Not long after that, he began lapping the faster cars in the field. At the end, only five cars were not lapped. Not lapped was Hinchliffe. At about the half way point of the 300-lapper, Hinchcliffe began to move in. The Canadian driver was mounting pressure on Newgarden until lap 213. On that lap, Hinchcliffe pushed too hard, bobbled, left the racing line and all pressure on the defending champion ended…for the time being. Hinchcliffe who fell to third and several seconds behind the leader was in no mood to settle for a mere podium finish and began to work his way back to Newgarden’s gear box. On Lap 255, Hinchcliffe caught and passed a stunned Newgarden. Out front in clean air, Hinchtown was gone and apparently on his way to victory. But with seven laps to go, Ed Carpenter got sideway, had his front wing torn free by Sato and out came the yellow. Newgarden and several others pitted for tires while Hinchcliffe stayed out. However, officials could not get the race restarted before the checkers dropped and the win was Hinchcliffe’s. Next up for the series is a race through the streets of Toronto, Canada.